With 11 million people still searching for employment, I hope President Obama’s State of the Union speech offers meaningful policy options to create needed jobs. That may well be a long and difficult process and the sooner we start, the better. Don’t expect to do more with less Over the past decade, the public workforce system has seen declining investments in workers who need to be trained or retrained for the new economy. 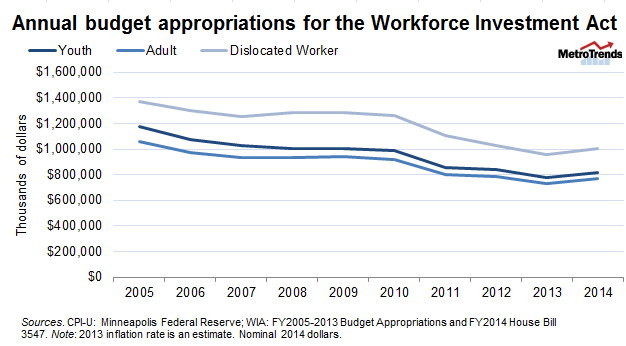 While the American Recovery and Reinvestment Act provided a burst of funding for the workforce system, those dollars are gone, and resources for training continue to decline. Additional funding for vocational programs and services is necessary to train the millions of workers who may be a good fit for available jobs. The Pell Grant program provides a considerable amount of funding to students seeking training, but doesn’t cover many valuable non-credit programs. Moreover, students too often use these funds for programs that do not really help them meet their labor market goals. Encourage meaningful involvement of employers People will not be able to get jobs if their training does not match the needs of employers. One way to make sure that people develop the right skills is to involve employers in the development and operation of workforce development programs.Although the federal workforce system has made attempts to encourage their engagement, employers’ involvement is generally limited. Expanding tested approaches, such as sectoral employment programs, apprenticeships, and other kinds of work-based learning may be an effective way to encourage greater employer engagement in workforce development efforts. Scale up innovations that have been shown to be effective in improving outcomes for students Recent federal investments in community colleges, like the Trade Adjustment Assistance Community College Career Training Grants, have focused on building their capacity to serve adult and other non-traditional students. Through these investments, institutions have experimented with new methods of instruction for low-skill adults so that they can earn industry-recognized credentials and college credit while they improve their basic skills, revamped advisement and counseling services through the use of career/college “navigators,” and greater availability of online/hybrid programs to improve access.As evidence of their effectiveness emerges, the federal government should focus on replicating and expanding successful strategies so they become widely used methods for delivering high-quality education and training, rather than just a smattering of successes across the country. Make it easier to track the outcomes that matter Workforce development programs have long faced a challenge with tracking participants’ outcomes. Programs often lose touch with former students, and efforts to follow up can be both resource- and labor-intensive.Integrated data systems can make it easier to find out what happens to students after they complete programs, allowing policymakers and programs to assess whether investments in workforce development make a difference. For example, there have been federal and state investments in the creation of P-20 (pre-school through college and into the workforce) data systems linking education and workforce records. However, these systems are still not commonplace due to IT capacity and confidentiality concerns. Properly secured, these systems can help us answer critical questions about what students need and what programs work. Help consumers make good choices for post-secondary education and training A vast array of programs provides postsecondary, occupationally focused education and training. However, there are few centralized resources that provide education- and training-seekers with information that allows them to make good choices. Several states are developing online systems that compile data on education and employment outcomes of community college students, allowing consumers to compare programs within and across institutions to better assess their quality.The challenge of these systems is that they do not necessarily capture education’s many non-quantifiable values and benefits. Even with information in hand, those seeking training need guidance in navigating their choices. The workforce system does this, to some extent, through its American Job Centers (formerly One-Stop Career Centers), but many seeking education or training do not access these services. A group of national experts (including Urban Institute Senior Fellow Sandy Baum) has proposed linking academic and career guidance to the receipt of Pell grants to help older students make good choices about college. Better information and better guidance are needed to help students make good choices and gain the skills needed to fill current job openings. 6. Stop importing so many foreign workers. I really don't think more funding to government intermediaries is the right way to go. I think trying to incentivize private business to expand business (especially small businesses) is more likely to help. That requires government to "soul search" and find ways to stop doing the myriad of things it does to make it tough to start and to survive a business. While these are excellent suggestions, they aren't likely to help the millions of older workers, many of whom have been unemployed for a year or more.